Join us in helping Hurricane Harvey Victims by making a monetary donation to the Salvation Army at any of our locations. A cash donation allows charitable relief agencies such as The Salvation Army to use monetary contributions to purchase exactly what disaster survivors need. Monetary contributions are also easy to get to the disaster area. Moving a container of donated goods can sometimes cost more than the value of the items. Getting a donated commodity into containers and onto a truck, quantity checked and sorted, and organized into warehouses, incurs a cost at each step. Supplies can almost always be purchased locally at the disaster site and provide savings in multiple ways. Money used to purchase needed items locally can support local and state economies, helping local businesses and workers, which have suffered losses in the wake of the disaster event. Baue is accepting cash and checks made payable to The Salvation Army (designated to Hurricane Harvey) until Friday, September 8. 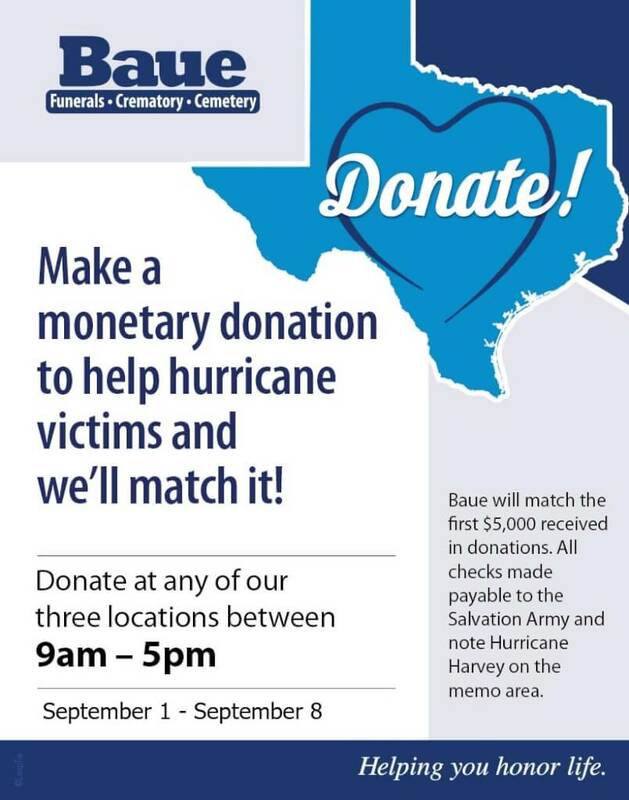 The first $5,000 received in donations to any of our locations will be matched by Baue.